MATERIALS 1. Solid wood frame covered with HR 40 kg/m3 foam. Suspension made with NEA elastic webbing with 10 year guarantee. 2. Seat cushion made with HR 35 kg/m3 foam plus viscoelastic layer. Almohada de espu- ma de poliuretano con aceite de soja. Polyurethane foam cushion with soybean oil. Glue used is water based. No solvents from oil products used. 3. Backrest cushion made with down touch microfiber (Microgel). 4. Chromed legs (p-52), or made out hard beech wood (p-25; p42). A model offering a large number of modules so we can get as many compositions as customer need. Suit however is not a regular mo- dular sofa. Suit is a clear example of our know-how, our taste for the cared manufacture and is a reflection of how our craftsmanship is able to achieve personality to the simplicity. This model opens to the user using the game, inviting you to combine textures and colours in order to give shape to the space through its modules. 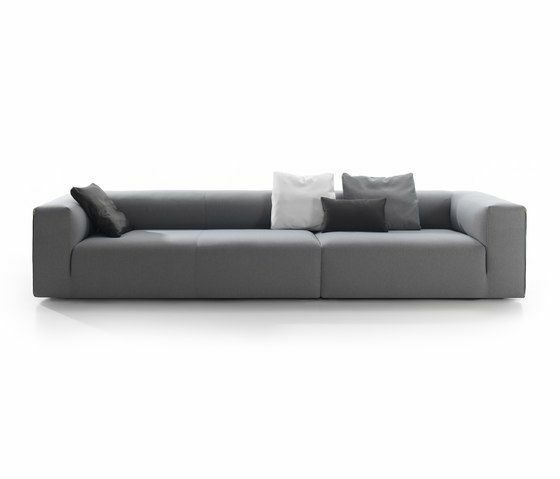 Arms not removable, integrated in sofa’s frame.